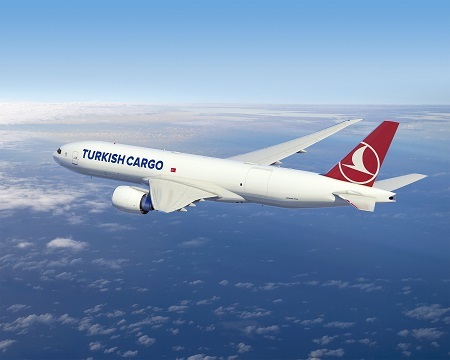 Turkish Airlines and US plane maker Boeing have confirmed the industry speculation regarding an order for a further three dedicated cargo aircraft from the growing Istanbul based airline. The airline has ordered three 777 Freighters to further enhance its long-range freighter fleet as it pursues its goal of becoming the world's largest cargo carrier. "We are excited to expand our efficient cargo fleet with the 777 Freighter. This aircraft has contributed greatly to Turkish Cargo, Turkish Airlines' successful sub-brand, becoming the fastest-growing air cargo carrier in the world. The additional aircraft will provide us more flexibility to serve even more destinations as we continue to grow our global freight network," said M. İlker Aycı, Turkish Airlines Chairman of the Board and the Executive Committee. Based on the 777-200LR (Longer Range), the 777 Freighter can fly 4,900 nautical miles (9,070 kilometres) with a full payload of 112 tons (102 metric tonnes or 102,000 kg). The new order comes days after Turkish Airlines posted record profits for the first nine months of 2018 on strong passenger and cargo demand. The carrier's air freight business saw a 25% tonnage increase and a 29% revenue increase compared to the same period a year ago. The results extend the airline's success in recent years as Turkey has become one of the largest and fastest-growing aviation markets. In line with the rapid growth, Turkish Airlines has steadily expanded its current and future fleet. Last January, the carrier announced the order of three 777 Freighters. Two months later, Turkish finalized an order for 25 787-9 Dreamliners and five options to prepare for growing demand at Istanbul's third airport, named "Istanbul Airport" by Turkish President Recep Tayyip Erdoğan during its official opening last month. Over the past few months, Turkish has begun taking delivery of new 737 MAX aeroplanes to refresh its single-aisle jets. In all, the airline's fleet of Boeing jetliners has grown to more than 160, with nearly 100 additional jets on order. "Turkish Airlines has achieved significant success over the past decade. In addition to introducing innovations that have powered the growth of Turkey's commercial aviation sector and anchored a new state-of-the-art airport, the airline is delivering outstanding results and rising in the ranks of elite airlines. We are extremely honoured that Turkish Airlines has placed its trust and confidence in Boeing's flagship aeroplanes: the 737 MAX, the 777 and the 787 Dreamliner," said Kevin McAllister, of Boeing.